Huesca is located on the northeast of the Iberian Peninsula, a few kilometers from the French border, has good communications by road, 3 hours from Madrid and 3 hours from Barcelona, also with bus and RENFE (train). The highest peak in the Pyrenees: the Aneto, and others such as Posets, Maladeta, or Monte Perdido can be found here. 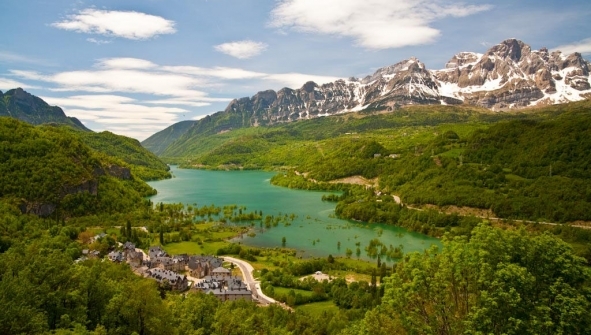 It has beautiful protected natural areas like the Ordesa National Park or Parque Natural de la Sierra y Cañones de Guara. If you are looking for winter sports, Huesca has a lot to offer with its five ski resorts: Candanchu, Panticosa, Formigal, Astun and Cerler. The adventure is completed if you love climbing, canyoning or hiking because this area is perfect for outdoor activities. Besides that, there is a lot of cultural heritage to see. Discover buildings like the Cathedral of Jaca, the San Juan de la Peña and San Pedro el Viejo in Huesca, where the pantheons of the Kings of Aragon are located. If you are looking for Serrablo Mozarabic art you have to stop by the churches, which will not disappoint you. Loarre Castle, the Collegiate Church of Alquezar, San Pedro de Siresa or Sigena are places that you should not miss, so go and visit them. And don´t forget the two routes of the Camino de Santiago that pass through this province. If you are visiting in August, do not miss the festival of San Lorenzo, the folk dances and the offering of flowers and fruits to the saint. To relax after a long day you can choose one of our charming hotels that will bring the whole experience to a even higher level.